The 1998 Argentina HDR is a document on people’s perception of human development and the possibilities for, and threats to, human development. The report analyses Argentineans' perception of themselves and their society. 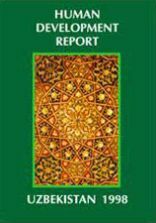 The main goal of Uzbekistan's 1998 report is to analyze the role of the state in economic, social and democratic reforms in the period of transition. The report looks at the social polices being implemented throughout the country with programs on gas. The 1998 Ukraine HDR covers human development in general. Ukraine’s performance is discussed and compared to other countries and the HDI is presented by regions.